Dr. Bruce Taheri received his Bachelor of Science degree from the University of Maryland at College Park in 1994. He attained his Doctorate of Dental Surgery from New York University (NYU) in 1999. Upon graduation, Dr. Taheri entered the North Brooklyn Health Network and completed his General Practice Residency at Woodhull hospital in Brooklyn NY. Having lived in Washington DC suburbs for most of his life, Dr. Taheri then returned to Northern Virginia to further expand his career in private practice. 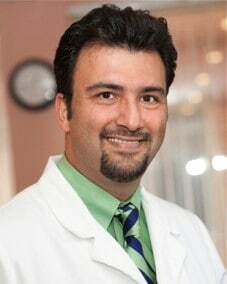 He currently owns and manages two multi-specialty dental practices in Woodbridge and Manassas, VA.
Dr. Taheri has been a member and past president of several local dental study clubs. Dr. Taheri continues to educate himself in order to provide his patients with the best quality treatment they deserve by attending courses and conferences nationwide. In his spare time, Dr. Taheri likes to travel worldwide, play sports such as tennis, racquetball, soccer; and spend some quality time with his wife, Dr. Massi Taheri. Dr. Taheri is fluent in Persian (Farsi), German, and some elementary Spanish. As a dentist who performs some of the most complex dental procedures, Dr. Taheri understands the unique connection our mouths have to our overall good health. That’s why he’s committed to help educate patients on the importance of proper dental health and doing whatever it takes to Make It Easy To Smile! Dr. Taheri and his team of dental professionals are dedicated to providing excellence in comprehensive dental treatments including teeth whitening, porcelain veneers, Lumineers®, bonding, restorative dentistry, crowns, bridges, removable dentures, Invisalign®, non-surgical periodontal care, oral conscious sedation, TMD care, comprehensive full mouth reconstruction, and dental implants in Woodbridge, VA and Manassas, VA.
© 2019 Taheri Dental Group of Woodbridge.